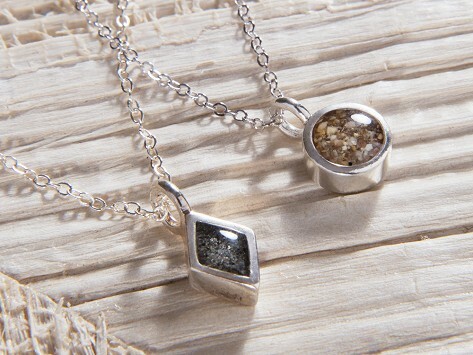 Capture and carry your favorite beach in a custom sand necklace. Dune’s handcrafted sand jewelry encases grains from a special beach, golf course, ballpark, or trail to create a one-of-a-kind accessory. Send them a capsule of your own sand or choose from their collection of over 1,500 beaches worldwide. Adjustable sterling silver chain with jump rings at 16", 18", 20"
Dimensions (in packaging): 3.5" x 3.5" x 1"
Turn your favorite beach into a handcrafted, custom sand jewelry that’s made here in the USA. Maker Holly Daniels Christensen wanted to capture the sunny memories of her childhood on the beaches of Cape Cod. She did this by turning sand into wearable gems. You can send her sand from your own chosen location or use the sand she already has. Her collection includes samples from over 1,500 beaches from around the world. Each accessory is hand sanded, encased, then embellished with fine silver for a modern, matte finish. It’s a personalized accessory you’ll treasure. Whatever your favorite seaside location— even a golf course, ballpark, or hiking trail—you can now always carry it with you.